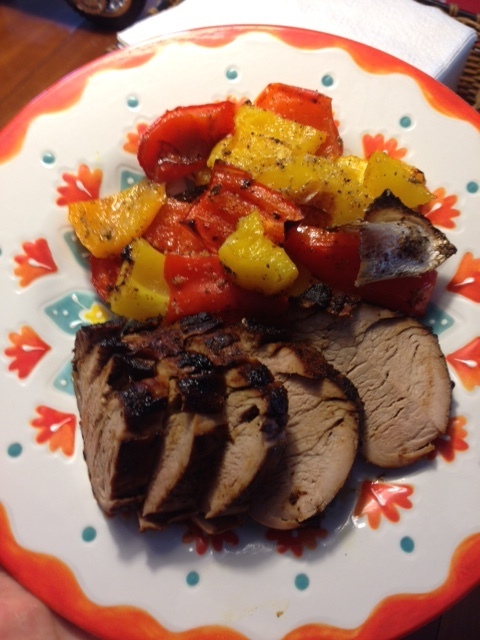 Earlier this week, I created the most delicious marinade ever for some pork tenderloin. And I used a new technique for cooking the tenderloins that is now going to be my go-to method. After marinating the pork for 4 hours or so, I seared it for about 5 minutes per side in my cast iron skillet (Pork tenderloins have 3 sides. Did you know that?). Then I put it into a 425 degree over for just about 12 minutes (I waited until the internal temperature registered 140 on my handy in-oven meat thermometer and then I took it out.) Not only did this result in a great sear on the outside of the pork, but I also only used one pan. Win! Combine all ingredients in a small microwavable jar or bowl. Mix thoroughly and microwave for about 30 seconds, just enough time to get the honey to melt enough to combine with all the other ingredients. Put the marinade with the pork in a ziploc bag, and refrigerate for at least 4 hours. See above for pork preparation. I served this with roasted bell peppers and onions, and it was a huge hit.